Into the 1970s, camp cars were a railroad tradition. Often converted from old heavyweight passenger cars from the 1920s or 30s, camp cars were used by the railroad maintenance-of-way department for housing track crews (or “gangs”) which moved around the railroad’s system to work on various projects. Crews slept in the converted cars, and ate their meals on board as well. When a project was complete, the cars would be picked up and moved to the next work location. Conrail inherited a sizeable fleet of camp cars from its predecessor roads, especially from the Penn Central. 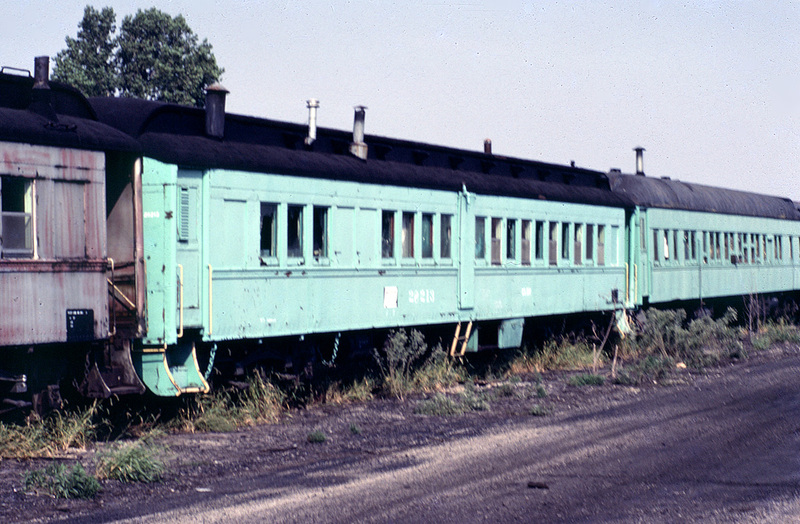 By the time Conrail was formed in 1976, many of these cars were already out of service and stored in yards around the system, and very quickly the remainder were phased out and replaced by modern camp cars, which were essentially a mobile home on a flatcar. 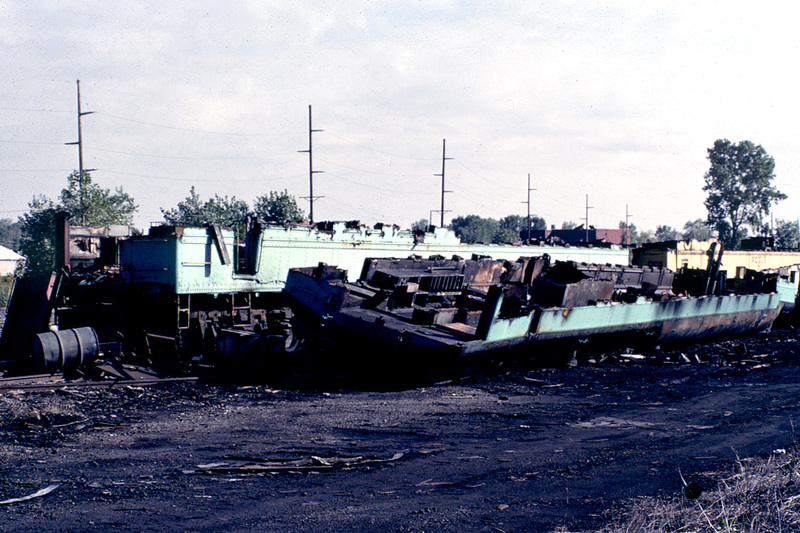 In the early 1980s, Conrail started disposing of the many camp cars sitting in yards around Toledo, Ohio. Cars were often burned first to eliminate the wood and other combustible materials in the interior, leaving just the metal to be cut up. The photos below show some of the survivors and how they met their end in 1982 and 1983. Penn Central camp car #28213 sits at Conrail’s Air Line Junction yard on 02 October 1983. This appears to have been converted from an ex-NYC 4-axle coach, with an additional door later cut in the side. 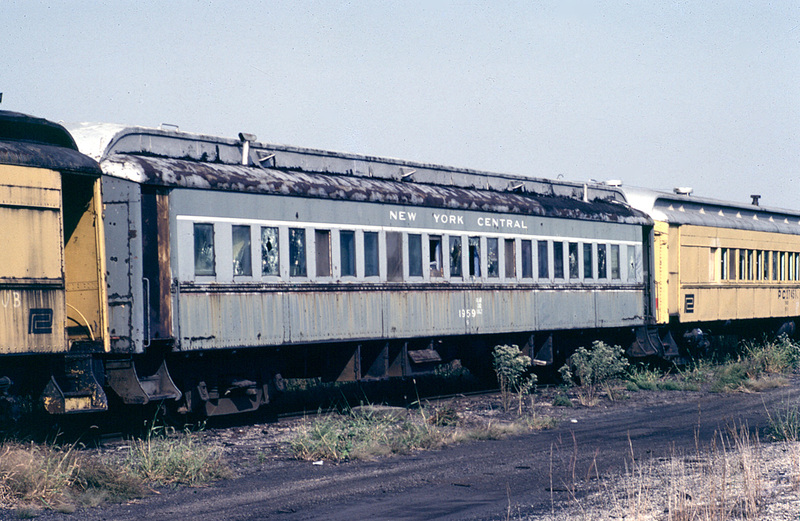 Former-New York Central coach #1959 never lost its two-tone grey colors when converted to MOW service. 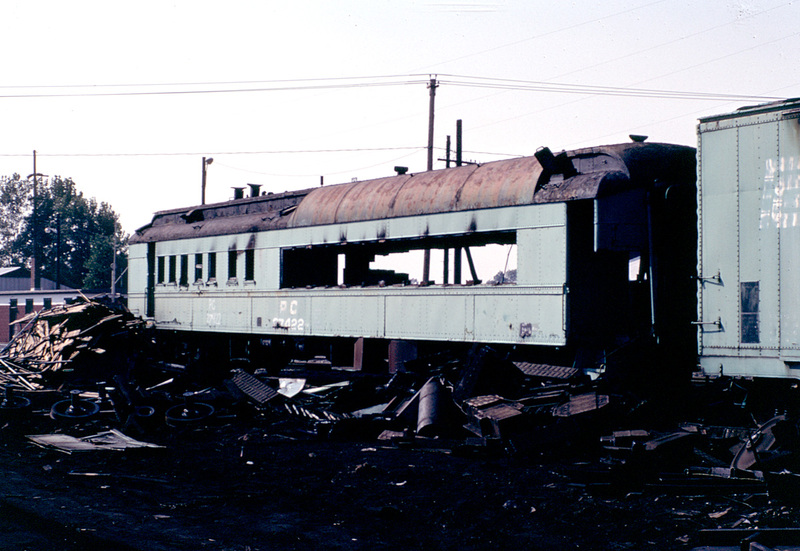 It awaits scrapping at Air Line Yard in Toledo on 02 October 1983. 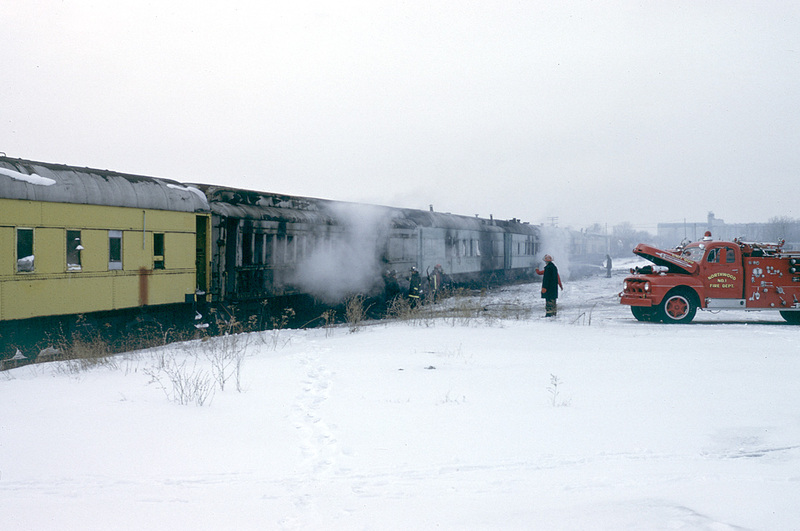 The end is near for PC #27422 at Air Line Yard in Toledo, on 02 October 1983. Scrappers have already burned the interior of the car, and started removing metal in the window area. This appears to be a former Pullman dining car. Another view of PC #27422 at Air Line Yard in Toledo, on 02 October 1983. 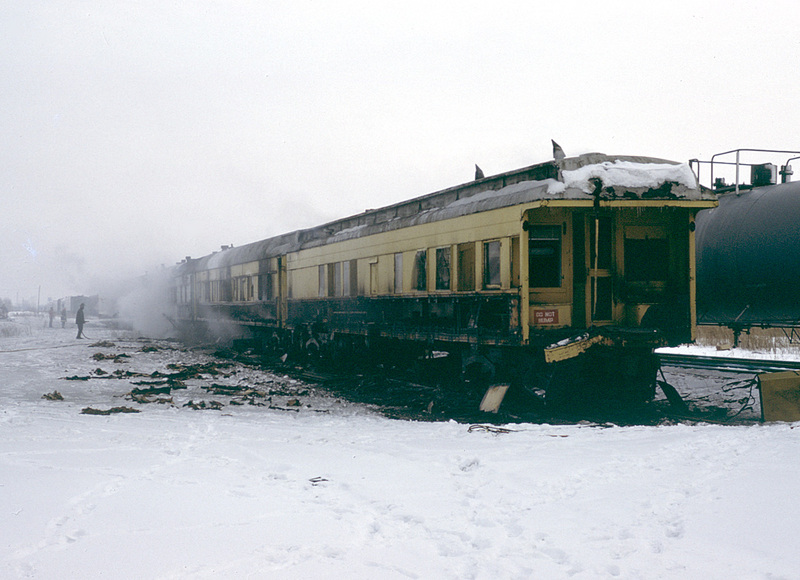 One week later, and this is all that remains of PC #27422 at Air Line Yard, on 09 October 1983. The roof of the car has been flipped over on the ground to allow it to be cut up and hauled away. 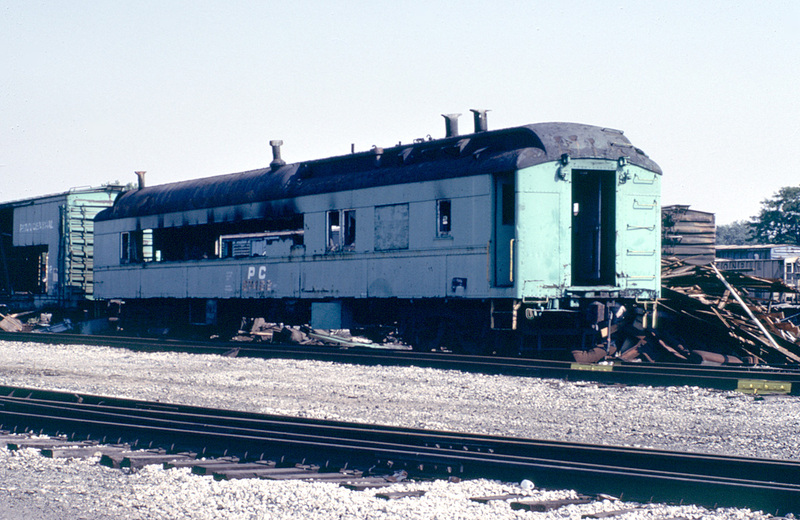 Another set of Conrail camp cars were scrapped in the former-PRR yard near Wales Road. The Northwood Fire Department is keeping an eye on things as the cars smolder on 09 March 1982. 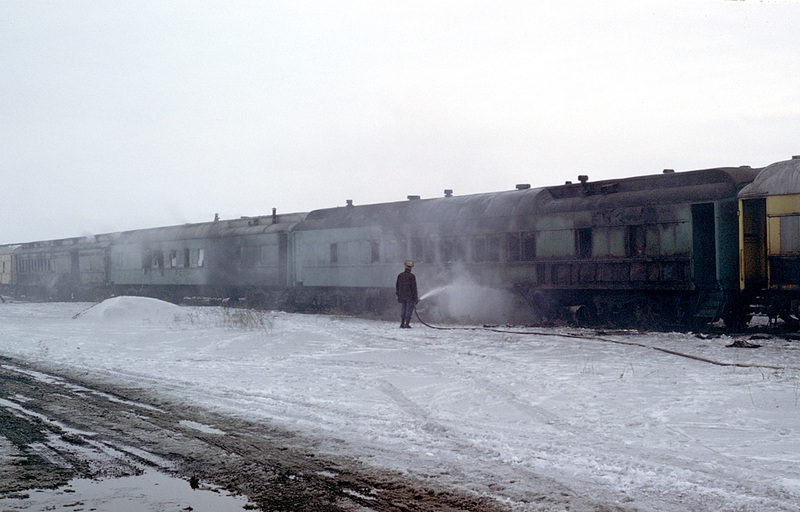 A fireman maintains a spray of water on a former-Pullman sleeping cars as the cars smolder on 09 March 1982. The last car in the line of camp cars was, appropriately, a former open-platform observation car.